Today I had some spare time while in the vicinity of one of the nature parks of The Netherlands. 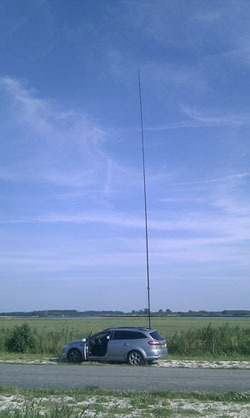 Luckily I brought some equipment with me (FT-817) and I always have a Spieth mast (fishing rod type of mast) and a couple of end fed wires with me. It was a bit windy but the sun was shining and temperatures were around 30C. I found a quiet spot next to the lake and near to the sea, hoping that would help me getting my signal across the globe. 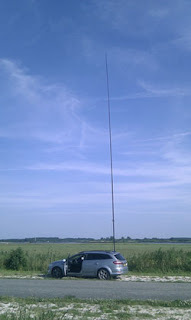 This was my first WFF activation and as far as I am aware it was also the first activation of PAFF-014. I was really amazed about the pile-up I caused. I was never aware WFF locations were this "hot". Somewhere in time someone posted a spot and then the frequency got more and more crowded. I worked a total of 154 stations in 3 hours, 90% of those in the first two hours (propagation went down in the end). My voice was hoarse in the end but I found a very nice experience. Thanks to all the OM's that took the time to answer my call, maintaining their patience to make it possible for others to work me.